article & photography by Mike Stotts – www.BackstageAccessVegas.com Copyright June 3, 2012. All Rights Reserved. No use in whole or part without expressed written permission of author. “The Duke” with his classic swagger is probably looking down with a jaundice eye from on high- his Wild West, though kicking, is on life support, and bucking with a major wallop- in more ways than one. The modern day melodrama is personified by Riverside, Nevada’s rustic VO Ranch, otherwise known as Bundy Ranch, a smooth 80-mile drive northeast of Tinseltown, USA- Las Vegas, Nevada. And just so you don’t get the wrong idea, this is far from an ordinary ho-hum tale about lethargic cows and tobacco-spitting cowpokes. If this doesn’t provide all the elements for a classic movie or novel, then nothing does. What it is, however, is major cultural history in the making: It is the last remaining working cattle ranch in Clark County, Nevada. And the ranch’s valuable contributions to the American way of life and justice system extend far and wide, really without any geographical boundaries, and its effects pertain to many similar situations throughout the country. 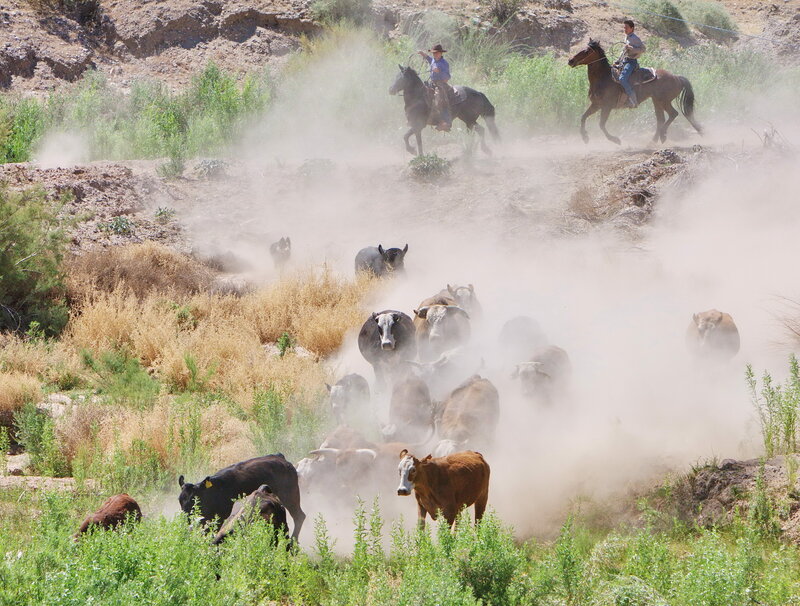 The Bundy Ranch is fighting tooth and nail to keep alive a uniquely western icon – the working cattle ranch. The ranch is trying to survive in hard times, feverishly pulling out all stops to provide a whole host of luscious seasonal melons and prime organic-grown beef raised on renewable natural resources to their buying public. Fertilizer and petroleum-based growth products are forbidden words around the ranch. The sprawling, otherworldly 150,000-acre gem of a ranch borders the Virgin River and is centered on its quintessential cowboy and family matriarch, 66-year-old Cliven Bundy. God-fearing Bundy is a devout family man – 14 children and 48 grandchildren- and a cowboy’s cowboy in every respect, from his distinguished chiseled looks, to his jangling spurs, to his wiry, once bare-back riding frame, to his uberman strength—let’s just say that he can make any rank cow wince just at the thought of being wrestled down for a hot branding iron. Translated: If you get Cliven Bundy irritated, just be prepared for the consequences. And, as with any good classic western movie, there is, of course, conflict. In the ranch’s case, the battle royale is provided courtesy of the U.S. Department of Interior’s Bureau of Land Management (BLM). Given their druthers, it seems, they would like nothing better to swoop down en masse under cover of semi-darkness with oodles of contract cowboys and helicopters to hijack Bundy’s 500 or so head of genetically superior range cattle from the so-called “Gold Butte” rangeland- home for the Bundy family and where they have legally lived and abided by all laws since 1877- that’s 135 years! What’s all the hubbub about? The BLM is, according to Bundy, now assuming the role of a landlord and not a manager, as was originally intended back in the 1990s, after initially having an administration-only role when the agency was formed in 1956. The BLM strongly asserts that the Bundy land should be preserved for all and cattle over grazing and cowboys due irreparable damage to the land and the many critters that inhabit it, including the endangered desert tortoise. Besides, they need to start collecting revenues in the form of public use fees. In their minds, the Bundy’s are simply using the water and land rights for free. From their perspective, it’s necessary to control and restrict access and allow the property to grow and develop in its own “natural” way, thereby turning the land into yet another federal conservation area, more aptly a stoic wilderness- and, in the process, add yet one more federal land parcel to their burgeoning land coffers– where the federal government already controls at least 86 percent of Nevada’s available land area. As Cliven Bundy says, “The BLM puts a sidewalk through the land and then tells you not to get off on the grass.” His point of view can easily be supported just by casually driving through the area – the growing “do’s” and “don’t” signs are clearly visible and restrict the public that the BLM serves from anything more than really a car-side snapshot of the land. However, although the federal government purportedly claims “control” over these lands, there is mysteriously no bill of sale, says Bundy, to show the sale approval from the State of Nevada legislature. What are some other points surrounding this intriguing Bundy-BLM feud? Again, mysteriously, there is no evidence that the public and private interests have ever even joined together in a mutual environmental impact study on the lands up to this point, so it’s really hard to deconstruct the volatile situation and dissect fact from hearsay. But even temporarily putting that embarrassing and tragic land management fopaugh aside, a simple visual tour of thousands of acres on the ranch reveals the much ballyhooed environmental “damage” is quite to the contrary: The cattle, as witnessed, do not damage the land. In fact, it was rare to find any trampled down vegetation and over-grazing effects, let alone remnants of human refuse and trash. There is, however, plenty of evidence that Cliven Bundy has expended many railcars of sweat to tirelessly construct and maintain an unbelievable network of land access, grazing, and water improvements- including making water drip lines leading from tanks to water troughs on the property – 30 and counting – while always burying the supporting underground water lines for miles in the scorching desert. The land provides way more than sustenance for his herd of cattle, too. It also supports a thriving and growing population of wildlife, including deer, quail, chukar, coyote, mountain lion, and others. One water access tank alone, says Cliven, provides a new home for up to 300 quail and chukar, as well as other wildlife. It’s also already a great public place to come out and recreate, enjoying what the countryside has to offer. Hunters, campers, sightseers, off-roaders, and multi-users alike have enjoyed access to these lands. Cliven Bundy is not selfish. Further, by permitting the cattle to selectively graze and feed (“prune”) close to the ground, as Cliven Bundy contends, this encourages the quick growing, low-lying green vegetation to crop up in its place, which is then used as very nutritional feed by many smaller critters – yes, including (and especially) the maligned tortoise – while at the same time greatly reducing the massive fuel buildup caused by unchecked tall grasses that foster out of control wildfires resulting in a blackened landscape which ultimately yields an unsustainable plant and animal habitat for many years. But, to see what this really means, you really need to go out and tour the area. It all then becomes crystal clear. Quite simply, the all-day tour over thousands of acres (and over roads, many of which were made by the Bundy’s), revealed the Bundy Ranch is very pristine, almost angelic, effectively and efficiently serving a wide range of flora and fauna. One could only wish that our national parks could be only half this conscientious in many of their land management programs. Legally, though, it’s been a very tough calf to rope for Cliven Bundy. Hardly a day goes by without some legal fandangling. It just wears down your soul. All 52 of his other nearby rancher friends eventually succumbed to the stress of it all over many years – some even dying from it – and ultimately gave up their preemptive resource rights due to government pressure, signing off their land grazing and water rights contractually to the federal government, and thus closing their ranches down for what, on the average, amounted to receiving the value of a new car. But during it all, Cliven Bundy, somehow, remains steadfast and resolute in his desires and through his actions to keep his ranch open and free of any government encumbrances, no matter what, while buying or inheriting his land resource rights legally. And, different than his past rancher bros, Cliven Bundy has had no contract with the federal government for 15 years. But, apparently, that doesn’t matter one iota to the federal government. Where the States and local entities and not the federal government should really get involved in matters of sovereign land and resource rights within its borders, by decree of the U.S. Constitution, the State of Nevada has remained mysteriously quiet on acting and voicing any statement or decree on the matter. Applying not just to Nevada lands, it appears, the federal government, acting through the Department of the Interior and the BLM, has many times ostensibly created and authorized nearly carte blanche powers when it comes to controlling lands within western states. To wit, on April 11, 2012, the federal government was about to raid the ranch and spirit the cattle off the Bundy Ranch, armed with an antiquated 14-year-old U.S. District Court of Nevada decision, but then mysteriously (amazing, how that word keeps cropping up, isn’t it?) called their coup off with but a week to spare. The situation, however, remains very volatile and is far, far from being resolved. Cliven Bundy merely considers it a timeout – maybe a stay of execution? – if you will. Although government authorities have verbally called off the raid, nothing official in writing, mysteriously, has ever legally been received by Bundy to permanently call it off. The raid, then, can be renewed and take place on any given day. Talk about living on needles and pins. Although Bundy was not named in this latest action, only time will tell if this will become merely an end-around play with a flea flicker to the BLM and, once again, Bundy Ranch in the crosshairs. While there can be an argument made for preserving the natural habitat of the Southern Nevada desert, there is also a valid argument that can and should be made for preserving a way of life – really, a culture – that extends back more than a century to when the Southwest was initially settled. Bundy Ranch is not a place where visitors go to see a performer in cowboy boots and a red kerchief lasso a post and drawl on about chuck wagon dinners. When dad brings out the rope at the Bundy Ranch, it’s to heel a calf so it can be branded and dinners cooked in the long house by mom. The next generation of Bundy Ranch cowboys – the Bundy children, grandchildren, great grandchildren and even his extended family, you might say – have already begun to learn how to manage the cattle herd and maintain the very desert land that the BLM is so worried about being desecrated. And that may be the major point overlooked in this sad movie-like saga: The Bundy family have a vested interest and ongoing active incentive to ensure that their land is not overgrazed or ruined. Without their land, their cattle won’t survive, and other flora and fauna will go by the boards. And there won’t be fresh, local-grown beef on your table either. Being an environmentalist is not something the Bundy’s may talk about, but it is nonetheless a lifestyle they’ve effectively lived and prospered for more than 100 years. There are no Las Vegas glitz and showgirls here- and, thankfully, never will be. Few family-run businesses can claim they’ve been successful for five years, let alone in three different centuries, like the Bundy’s. That’s an incredible accomplishment. So, perhaps the BLM should pull out their play book and take a long look at how the Bundy Ranch family has accomplished this unusual feat. And, in so doing, they would see a family dedicated to maintaining and preserving the natural desert habitat and its many renewable resources, while also maintaining their historic family legacy- the cattle ranch. There has to be a way for both of these parties and their purposes to be served without sacrificing one for the other.